Most fishermen have a few special places they enjoy returning to year after year. For the better part of forty years now, Lake Powell in southeastern Utah has provided me with countless fishing opportunities and special memories with family and friends. It offers a variety of fishing options for high quality day trips, weekend campouts or week-long adventures on a houseboat. Spring, summer, fall or winter, there is always excitement brewing on this dramatic desert setting on the Colorado River. Construction of the Glen Canyon Dam was completed on the Utah-Arizona border in 1963 creating Lake Powell and it’s nearly 2,000 miles of shoreline stretching into the Utah canyonlands. It’s part of the Glen Canyon National Recreation Area, nestled into the Colorado Plateau, with endless red rock shear wall canyons, clear water, sandy beaches and some of the most scenic views in America. The reservoir also provides a tremendous warm water fishery that includes both small and largemouth bass, striped bass, walleye, channel catfish, crappie and bluegill. My brother and I started fishing Lake Powell with our dad back when we were teenagers and the lake was still filling. Day trips out of the Wahweep Marina to places like Warm Creek, Gunsight and Padre Bay in early spring resulted in some nice largemouth bass and an occasional bluegill or catfish. We stayed in the hotel near the marina or camped in the campground in tents and RV’s. In the late 1970’s, you could still catch a pretty nice rainbow trout on the gravel beaches of Wahweap Bay. The author with a late spring largemouth bass caught on the slickrock during the early summer. We made summer trips to the lake often during our high school and college years, splitting time between early morning fishing; switching to water skiing and bikini watching during the hot summer mid-day; then back to fishing late into the evening. Dad started an annual spring expedition up-lake, traveling up to 90 miles by boat to camp in secluded coves, which resulted in us catching numerous largemouth bass building spawning beds fresh from the depths after their winter slumber. We bathed in the lake and fell to sleep at night in our tents to the calls of wild burros braying in the canyons above camp. This annual pilgrimage continues to this day, a tradition passed on to our children and very soon I intend to take my young grandchildren to see the beautiful canyons up-lake, catch the numerous smallmouth bass who have moved in and hear the call of the wild burros of the canyon. Eventually we were able to afford to buy a share in a houseboat moored at Wahweap. It provided more comfortable overnight accommodations on the lake for the family during both the cold winter months and the hot summer months. This allowed us to experience Lake Powell’s fishing opportunities year-round. Fishing for striped bass, (commonly called stripers) with spoons and plugs during the early spring and searching for boils during mid-summer mornings can create excitement for everyone on the boat. Experience shows, once you locate a striper school, the action can be fast and plentiful. The fresh fish tacos later in the evening topped with homemade pickled cabbage and salsa made for great days. My brother started fishing bass tournaments routinely providing the opportunity to really learn the lake and associate with fellow anglers exchanging information on where to fish, what time of day and what lures were working the best. I know most of the information was probably lies, as no true fisherman would ever give up their prime fishing spots and secrets, but the additional time invested on the lake polishing his skills in preparation for a competitive tournament, definitely made him a better angler. Later I joined him for some team tournament events, more for the fun and comradery than the money - it was like being a kid again. We cruised the lake in a crotch-rocket bass boat at 60 mph like the pros do in the big-time tournaments, except without the big-name sponsor packages. What we lacked in prize money, we made up with in laughs, spending some quality time together. Matt Rosenberg with a Lake Powell striped bass caught in a cove of Wahweep Bay during the early spring on a jig. Lake Powell offers a vast expanse of canyons, coves, rocky points, shelf's and open water bays. Getting away from people on the lake is not a problem and fish can be found throughout the lake depending on water levels, water temperature and the season. There is a ton of good information available online. Check out the Utah Division of Wildlife Resources Lake Powell Fishing Report online at https://wildlife.utah.gov. For more detailed fishing information go to www.wayneswords.com to access reports from Wayne Gustaveson, the most recognized expert around regarding Lake Powell fishing. A Utah or Arizona Fishing License allows fishing on the entire lake and can be purchased online at the website above or www.azgfd.gov. There are lodging opportunities and boat rental services on the lake, including houseboats. Information is available from Lake Powell Resorts & Marinas at www.lakepowell.com. Other local hotel, restaurant, fuel and retail services are available in Page, Arizona, down-lake and near the Bullfrog Marina up-lake. There are other outdoor recreational opportunities in the area as well including exploring slot canyons, hiking, golf and guided expeditions on and around the lake. Getting to Lake Powell takes some time due to the remote location, but the journey across the Utah or Arizona high desert country can also be a spectacular part of the trip. A pair of bookend largemouth and smallmouth bass caught near Gunsight Bay on spinnerbaits. Sportsman’s Warehouse stores throughout Utah, Northern Arizona and Western Colorado stock fishing and boating gear required for fishing Lake Powell including an assortment of high quality rods, reels, line and terminal tackle for all species of fish. For smallmouth and largemouth bass, always have an assortment of minnow and crawdad imitations, plastic worms, grubs, crankbaits and spinner baits. For bluegill and crappie, downsize your grubs and tube jigs, remembering fluorescent colors work well. Stripers will bite anything that gets their attention - spoons, deep diving crankbaits, jigs or try bait fishing with anchovies. Walleye will bite all of the above if you find them in the right mood. Catfish prefer bait, so try nightcrawlers or stink-bait imitations. Check out the websites noted above for details regarding what species are biting and what depths to fish. Fishing guides are also available on the lake, just google Lake Powell Fishing Guides for availability, rates and contact information. Remember, lake water levels are constantly changing in Lake Powell to meet downstream water requirements in the Colorado River, causing the water surface landscape to constantly change as well. Rocks submerged last week may be out of the water this week, making navigation more difficult if you are not prepared. Most GPS enabled depth finders include topography charts of the lake which can help identify shallows and rock hazards. The National Park Service has marked the main river channel with navigation buoys and some of the major tributaries and bays are also marked. Detailed maps are available at the marinas. Submerged hazards may be marked with caution buoys along popular routes, but not all of them are clearly marked. Boat operators need to be cautious and pay attention while navigating the lake. 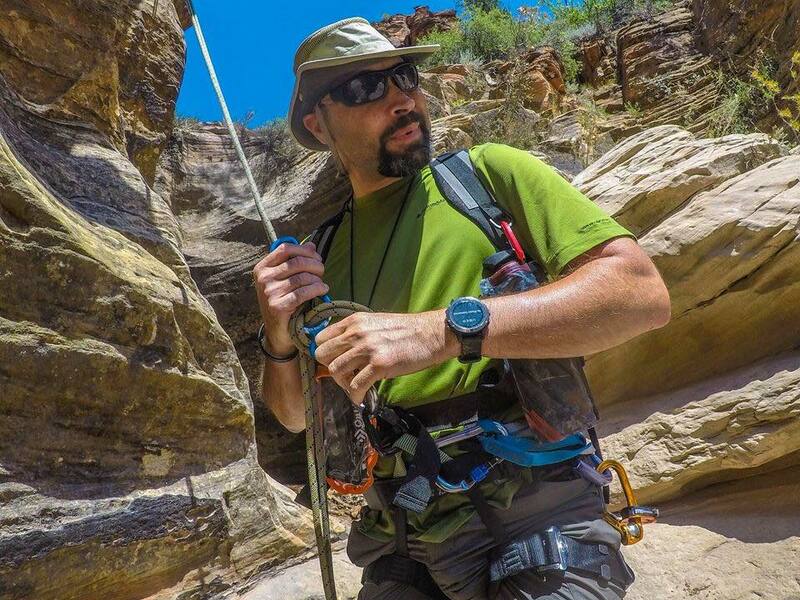 Boaters get lost in the slickrock canyon country every year, so be careful and be prepared. Cell phone service up-lake is spotty and help may be hours away depending on where you are. Going up-lake now brings a flood of memories, from those early trips with my dad, to the annual family vacations on the houseboat I still enjoy today, to the up-lake camping and fishing adventures and past tournament success. Lake Powell has been part of my life for over forty years and I hope to continue to enjoy the pristine scenery and bounteous fishing for another forty years, that is if my grandkids will let me tag along with them! If you have never been, don’t wait, get out there. If you are a regular like me, you already understand the excitement and anticipation we feel planning the next adventure back on the lake.